YesStyle - is a Chinese online shop founded in July 2006. It is focused on selling clothes of Asian brands. 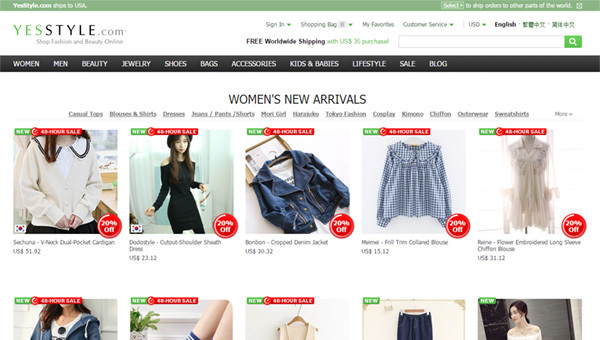 The website offers a wide range of women's, men's and children's clothing and even clothing for newborn babies, as well as shoes, jewelry, household goods, beauty products, cosmetics, decor items, household items, kitchenware, headsets, covers, cool accessories for smart phones and more. The shop is divided into sections of Korean and Japanese fashion styles, Mori and other styles of popular subcultures in Japan. It may seem that the shop is focused on the Asian market, but it is not so. You will find a wide choice of office wear, casual or evening wear on YesStyle. Prices are not high in the shop, and some goods are at a very high level. There are special programs for beauty bloggers, which help saving a significant amount. Payment for purchases can be made by a credit card. Shipping is divided into: express delivery - free in case of ordering in the amount of $35, standard - free from 35 $ and economical - free from $99. Excellent online store. I am very satisfied. Glad in it purchases.